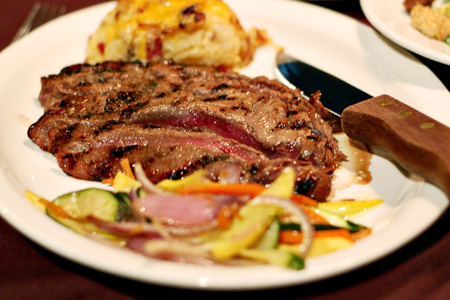 I recently read a local blog post that called Castle Ranch a "hidden gem of a steakhouse". After reading their take and listening to their interview with the manager, I decided that it was time to see what was hidden just down the freeway. A buddy and I go to dinner on occasion and we always go out for steak. When I told him about this new (to us) spot, we were both excited to try it. I told my friend that it was inside the local Holiday Inn, which explains the "hidden" reference in the blog post I read. Most folks would not expect to find an upscale steakhouse inside a Holiday Inn. We arrived wondering what type of atmosphere to expect. Upon entering the restaurant I felt immediately comfortable. It was upscale, but not so much so that you can't wear jeans. This was a very strong plus for me, right out of the gate. It was classy, but unpretentious. We were greeted by our server almost immediately and his demeanor matched the upscale-casual ambiance perfectly. He knew his stuff, but he was very welcoming and friendly. As I read the menu I understood what the manager meant when in the interview he stated that their aim was to get back to basics. The menu doesn't try to be all things to all people. It's a limited menu that sticks to great steaks, with a few other offerings like Kurobuta pork shank, Atlantic salmon, and Idaho trout. What's very refreshing is that they use locally-sourced ingredients. For example, they feature Double R Ranch premium Northwest beef. After chatting and perusing the menu, we both decided on exactly the same meal. This should certainly not be allowed among two dudes having dinner. It's just not right, but we went with it. 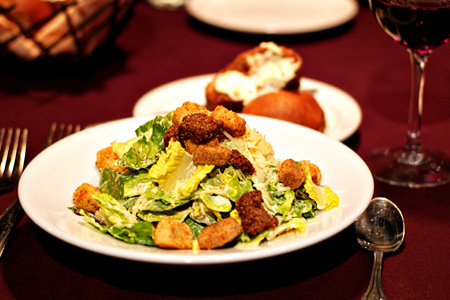 We decided not to get an appetizer and started with their Classic Caesar salad. There was plenty of it, and it was good. For our main courses we chose the 10-ounce flank steak, with cheddar hash as our side. The hash is a great take on, of all things, funeral potatoes. It's a lovely concoction of shredded potatoes, cheese, bacon, and cream of mushrooom soup. They are simple, but very tasty indeed. We both ordered our flank steak medium-rare, but I asked for mine to be closer to the rare side. Interestingly, mine (pictured below) was cooked perfectly while my friend's was pretty much just plain rare. I think the server may have given him mine by mistake. In addition to the hash, the meal included a medley of sauteed vegetables that were perfectly cooked. The steaks were good, and the tenderness was great, but we both agreed that they were overly marinated. There was a distinct flavor of soy that overpowered the beef. I think they were simply marinated too long. For dessert the manager treated us to their Xango (pronounced zane-go). 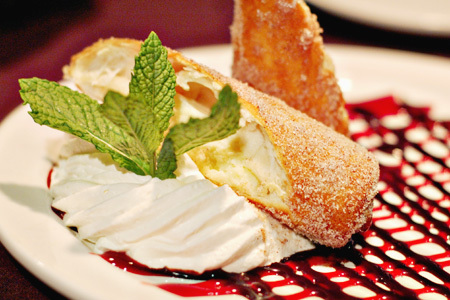 It's a tortilla that is filled with cheesecake, lightly fried, dusted in cinnamon sugar and served with whipped cream and plated atop raspberry and chocolate sauce. The dessert was an outstanding end to the meal. It was light and not overly heavy or sweet. I highly recommend it. In conclusion, Castle Ranch is indeed a hidden upscale, but casual, gem. The atmosphere, service and food were great, with the only exception being our overly-marinated steaks. In retrospect one of us should have tried a different steak for comparison. However, that just means I'll have to go back, which I will do gladly. 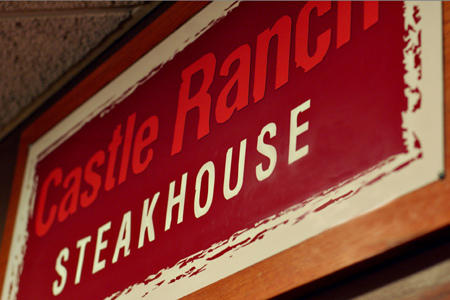 Note: Although I've called this a "local review", I should mention that there are three Castle Ranch Steakhouse locations. In addition to the one here in Boise, they also have a location in Price, Utah and Sante Fe, New Mexico.